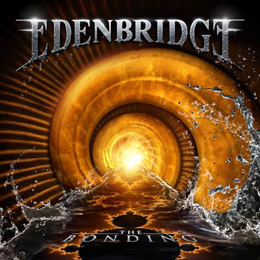 Edenbridge is a group that I haven’t really been following so far, and that seems to have been a mistake from my part. Their music is bordering between true gothic metal, and bombastic more opera-like music. They do bring us rock, but with an ethereal edge to it. In no small way does the voice of their vocalist Sabine Edelsbacher help to create this atmosphere. She has a smooth, almost angelical voice, yet also powerfull. For this record the band has enlisted the aid of a classical orchestra ‘Orchester Klangvereinigung Wien’. They had to call in sponsors though to finance this new record. While the orchestra can be heard, it is not exaggerated. Guest singers were Erik Martensson (W.E.T., Eclipse) and Robby Valentine – remember ‘Over And Over Again’ anyone? Fans of gothic metal, with a more subdued touch, will be very pleased with this new Edenbridge album I suppose. And since I like gothic metal, but think that often the female vocalists are exaggerating with the opera-like singing, with this band I don’t have that problem, since the music seems to have been written ‘on the voice’ so to speak of miss Edelsbacher. A nice album, fans of Treshold and Kamelot probably also will like.